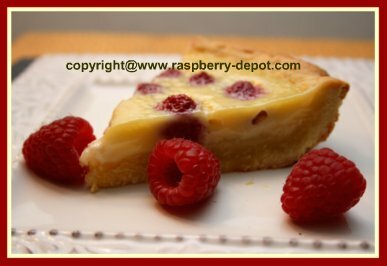 This Raspberry Custard Pie Recipe is one of the best! It includes white chocolate for an EXTRA special custard pie. 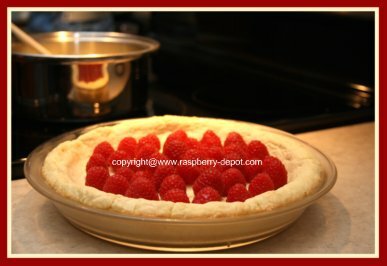 I made this recipe for a raspberry dessert this past weekend for our visitors, and it was scrumptious! Not only is this pie amazing in flavour but, it is very quick and easy to make too! In a bowl, combine the flour, salt and sugar and stir to combine. Add the butter and, using a knife or a pastry blender, combine until the mixture resembles coarse crumbs. Add the egg yolks, whipping cream and lemon juice and mix until mixture can be formed into a ball (if mixture is too dry, add a few teaspoons more of the cream). Pat the dough into the bottom, and up the sides, of a 9" pie pan. In a pan, over low heat, melt the chocolate in the whipping cream. In a medium size bowl, lightly beat the egg using an electric mixer on low speed. While beating, gradually add the chocolate mixture, and the vanilla extract, beating on low speed for about 20 seconds. Arrange 1 cup of the fresh raspberries on the bottom of the pie crust with their bottom (unopened) ends up. Gently pour the filling mixture over the raspberries, without covering them completely. Using a pie shield or aluminum foil, protect the outer edges of the crust from becoming too dark or burning. Bake the pie at 325° F for about 35 minutes, or until the centre is FIRM. Let stand at room temperature for a few hours before refrigerating. Just prior to serving, garnish the pie with the remaining raspberries and white chocolate shavings.